If you’re unfamiliar with the world of apparel manufacturing, consider using our clothing production checklist and sample production order for helpful tips on sourcing, costing, and more. After you share everything about you, the next step is to make sure they know what your needs are. Next, ask yourself, what do you need to be happy in a clothing manufacturing partner? Just as in the dating world where you’d want a guy who’s attractive, funny, and rich, but usually have to compromise, there are important characteristics to look for in a clothing manufacturer. In the manufacturing world, it’s weighing between speed, price, and quality. While great clothing manufacturers will have all three, it’s usually best to prioritize your needs and rank prospective clothing manufacturers so your final decision will be easier. Speed: Made Here, Sold Here – Fast. Imagine you have a big trade show, fashion event, or meeting with a buyer that is paramount to your brand’s success. You MUST have samples by then. Speed, then, is your choice. Or consider that you’ve just arrived from a trade show with a stack full of purchase orders (PO). Your buyers require delivery on a certain date. This means you’re under the gun and your delivery requirements must be communicated to your clothing manufacturer upfront. Be clear about whether your manufacturing partner has the capacity and bandwidth to move at the speed you need or if they’re too busy dating other brands and can’t commit. With thousands of fashion brands starting up each year and the many already established brands you’ll be competing against, we highly recommend that you place quality as a key priority. The best way to show a clothing manufacturer your quality standards is to bring in samples that you absolutely love from other brands. You can show them the sewing work that you love and even which areas you think can be improved. Work with your clothing manufacturer to understand how different sewing constructions impact your price points. Ask them to explain how they will ensure quality and what their quality control (QC) standards are. Their response will tell you a lot about how they will protect your product and you will know if they are a quality match for you. Contrary to what the media will tell you, producing in Los Angeles is still an extremely viable move. Especially for brands that choose to sell directly to the consumer, dependence on retailers who squeeze margins should be avoided. To determine your price points it’s best to start with your retail points and work backward to understand target wholesale and manufacturing price points (See 5 steps to an apparel line budget). One final note on price via the old adage, you get what you pay for. I’ve been practically harassed by production teams demanding prices that can only be attained from overseas countries with very poor working conditions. These same companies complain about poor quality and bad communication while aggressively requiring prices that would put the clothing manufacturer out of business. There is a large underground network of clothing manufacturers exploiting their workers by paying them below minimum wage. If you go this route, you will likely not be able to establish a reputation of quality clothing and it will be much harder for you to build a sustainable, growing brand. Now that you’ve given some detail about yourself, what you’re searching for, and what you value most in a partner, it’s time to play the field a bit and see what kinds of clothing manufacturers are out there. What is the difference from one to the next, and how can we identify a “player” from someone looking for a long-term relationship? This is literally just a sewing house. They do not source materials, make markers or cut fabric. They expect all materials delivered to them to be organized and they will only sew what is cut and ready to go. By working with them you’re committing to managing the other portions of production yourself. This is slightly more extensive in support. These clothing manufacturers do not source any materials and sometimes require that you provide completed markers. If you don’t know what markers are, continue below for a better fit. Full package is the whole enchilada. 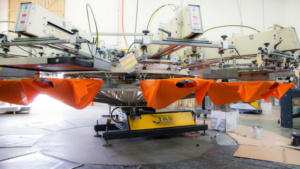 These clothing manufacturers are set up to support the entire process from procurement of materials to marking, grading, cutting, sewing, printing, finishing, folding, and packing. They are set up to support organizations that want to streamline their production and don’t have money to pay a full-time production manager running around the city overseeing all productions. A traditional clothing manufacturer, the player, is entirely focused on the end game. This can apply to any of the above, sewing contractors, cut & sew manufacturers, or full-package clothing manufacturers, so be sure to sniff it out as soon as you can and stay away. Traditional clothing manufacturers care only about big quantity orders and expect a purchase order (PO) prematurely – they want to take you home before buying you dinner. 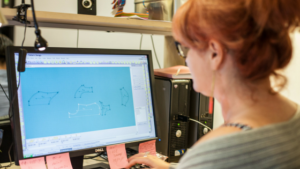 This is because they have experience working with larger brands who come to them with already developed products and a PO for substantial units. Here’s a conversation that I have witnessed dozens of times. This clothing manufacturer clearly specializes in production only and does not have a service that supports new designers. Make sure that if you need a clothing manufacturer that provides guidance, mentorship, and a complete service, you make it clear upfront. After taking these steps, we’re sure that you and your clothing manufacturer will be a match made in heaven. The key is to focus on the needs of your brand while taking into account your goals and your budget. Just like a relationship, you’ll want to end up with somebody honest and transparent who complements your strengths and weaknesses; and, just like in the real world, it’s best to go in with an understanding of what the industry looks like and all of the shady characters that you’ll want to avoid. Luckily, there are lots of great clothing manufacturers out there. Isn’t that what your grandmother always told you? The apparel manufacturing process can be daunting for new designers. To help you get started, we’ve created a clothing production checklist and sample production order that includes insider knowledge on sourcing, costing, and other important details. Best of all, it’s free.